White Beach, Puerto Galera, Philippines. One of the world's most beautiful bays. 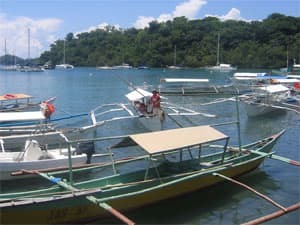 Puerto Galera is one of The Philippines' best dive sites, and much of the area is now a marine reserve. Several hotels have facilities especially created to cater for the requirements of divers. Shallow waters are also great for snorkeling. This destination features over two dozen prime dive sites, all of which are well worth diving. 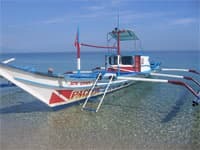 What's more, diving in Puerto Galera is possible all year round. Dungon Wall is an easy multilevel dive, with a dozen of attractions to be spotted from big barracudas to beautiful hard and soft corals along the slope and even a catamaran wreck. There is an abundance of aquatic macro life including big carpet anemones and porcelain crabs. Pandan Island is surrounded with great diving opportunities, and is a fantastic jump-off point for Apo Reef. On the island of Mindoro lies beautiful Puerto Galera, described as one of the world's most beautiful bays. 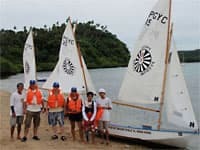 All kinds of activities can be enjoyed here, including swimming, sailing, water sports and diving. Puerto Galera is easily reached from Manila, requiring no internal flights. Puerto Galera is a gateway to some of the most unspoilt territories and national parks in the vast island of Mindoro. One will be lured to explore pristine lakes, rivers and waterfalls, meet indigenous tribes with their own stone-age hand-writing, or trek through lush vegetation and forests. As one of the most beautiful and safest harbours in the world, Puerto Galera is primarily famous for its splendid beaches, coral reefs teeming with marine life, and exquisite dive sites suitable for new and experienced divers alike. 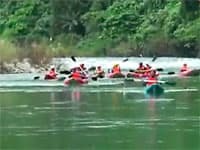 All kinds of activities can be enjoyed, including swimming, sailing, diving, island hopping, and trekking, and even whitewater kayaking. There is also a beautiful, challenging golf-course, which has been developed amidst dense forest and steep hillsides. White Beach and Sabang are just two areas offering lively scenes in Puerto Galera. People flock to these places for the party atmosphere. As soon as the sun sets, the shores of these serene beaches come alive to the tune of live bands and spinning DJs. There are rows of bars and pubs waiting to offer a party experience unlike anywhere else. Food and drinks are very inexpensive.